A. E. van Vogt, ca. 1957. Source: Sevagram: A. E. van Vogt, The Golden-Age Science Fiction Author. 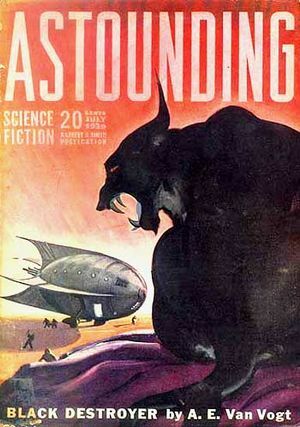 Cover of Astounding, one of A.E. Van Vogt's many novels. 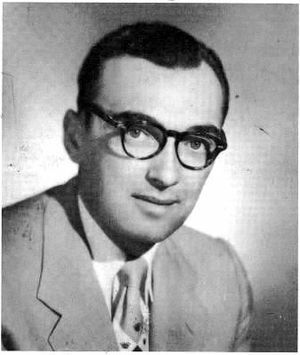 Alfred Elton van Vogt: science fiction writer; born on 26 April 1912 in Edenburg, Manitoba, Canada. He was the third child of six born to Heinrich Vogt (9 Mary 1886, Edenthal, West Reserve, Manitoba - 24 February 1968, Winnipeg, Manitoba) and Aganetha (Buhr) Vogt (30 September 1887, Edenthal, West Reserve, Manitoba - 6 September 1976, Winnipeg, Manitoba) who were members of the Bergthaler Mennonite Church of Manitoba. His grandparents and great-grandparents had come as pioneers to Canada from Russia in the 1870s. In 1939 Alfred married Edna Mayne Hull (1 Mary 1905, Brandon, Manitoba - 20 January 1975) of Brandon, Manitoba, who also became a Science Fiction writer. They had no children. After Edna's death, Alfred married Lydia Bereginsky Brayman. Alfred died on 26 January 2000 in Los Angeles, California. Shortly after his birth in the West Reserve in Manitoba, the Vogt family moved to Neville, Saskatchewan, where Alfred grew up and where his father practiced law. Though a gifted student, Alfred was unable to attend university due to the economic failures of the Great Depression. During the 1930s Alfred wrote romance stories and other articles for publication while doing odd jobs. In the late 1930s, likely coinciding with the parental move to Winnipeg, his lawyer father added the prefix "van" to his name so that the public would know them as Dutch rather than German in ethnic origin. Alfred along with many of his extended family also added this prefix to their name. Though raised in a Low German speaking environment and in the Mennonite community of Neville, Alfred never joined a Mennonite Church. Alfred was unable to serve during World War II because of poor eyesight. After living for a short time in Ontario, Alfred and his wife moved to Los Angeles, California where he found success as a writer. Alfred Elton van Vogt became internationally famous during the 1930s and 1950s for his series of science fiction novels that included The World of Null-A, and The Pawns of Null-A. In describing his writing style van Vogt told the critic Robert Weinberg that his style was "the fix-up" -- that is, the writing of a novel constructed out of shorter works of fiction stitched together. This led to some of his novels being a collage of plots and having unexplained plot jumps. In several of his science fiction works, components of his Mennonite upbringing are found, such as a plea for tolerance and non-violence and his outlook on the universe as a hopeful and wonderful arena. For example, in his most famous novel Slan (Serialized in 1940, then as a book in 1946 by Arkham House) the hero, a super human, refuses to kill and has hope, compassion, and forgiveness for normal humans. His novels are packed with a wealth of invention and wild technological ideas that anticipated both more recent science fiction writing and film and real technological marvels that have been invented since his writings. Van Vogt is often called one of the mainstay of science fiction’s "Golden Age" and many later writers in the genre acknowledge a debt to him. In addition to his autobiography and several nonfiction works on diverse topics, he wrote at least 39 science fiction adventure novels and many dozens of short stories and magazine articles. Most of his major works have been translated into over a dozen foreign languages. Though several are often called science fiction classics they are not literary classics and today, though he is still well known in Europe and South America, he is rarely read North America. A reoccurring theme in van Vogt’s writing is the power of the mind to control and manipulate both people and machines. One suspects that this pursuit for a superior mental system led him to develop a close relationship with L. Ron Hubbard and played a role in his running the West Coast base for Dianetics, the precursor to Scientology. However, when Dianetics turned into the Church of Scientology, van Vogt left. Dyck, John. "Alfred van Vogt: Science Fiction Master." Preservings No. 10 Part II (June 1997): 66. Ellis, Scott. "Surrational Dreams: A. E. van Vogt and Mennonite Science Fiction." Prairie Fire, vol. 15, no. 2 (1994): 204-219. Vogt, Alfred E. van. Reflections of A. E. Van Vogt: The Autobiography of a Science Fiction Giant. Lakemont, Georgia: Fictioneer Books Ltd., 1975. Brown, Sharon H. H and Victor G. Wiebe. "Van Vogt, Alfred Elton (1912-2000)." Global Anabaptist Mennonite Encyclopedia Online. March 2006. Web. 22 Apr 2019. http://gameo.org/index.php?title=Van_Vogt,_Alfred_Elton_(1912-2000)&oldid=136094. Brown, Sharon H. H and Victor G. Wiebe. (March 2006). Van Vogt, Alfred Elton (1912-2000). Global Anabaptist Mennonite Encyclopedia Online. Retrieved 22 April 2019, from http://gameo.org/index.php?title=Van_Vogt,_Alfred_Elton_(1912-2000)&oldid=136094. This page was last modified on 28 September 2016, at 06:43.